Feltmaking has become an extremely engaging craft. It is exciting to manipulate fibers and watch them transform into fabric. 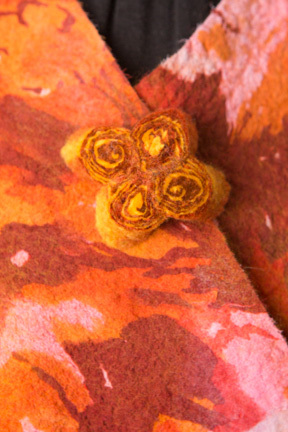 Feltmaking is tactile, forgiving and challenging. Felt artist Jo Ann Manzone has spent years studying her craft. She has had the honor of working with master felter Polly Stirling who invented nuno felting, felting on fabric. As you browse through Jo Ann’s studio, you will see the 3-dimensional depth of feltmaking in her beautifully crafted vests, scarves and coats. On the lighter, whimsical side you will find needle felted pumpkins and so much more fun with felt! As always, visitors will find galleries, open studios, art, and artists on all three floors of the Art Center. First Friday from 5:00 – 8:00 there will also be refreshments and live music.